I was looking at my Beer Cellar, while I have many beers that can age, not all can or should. As I was reviewing my list I found a couple that I had not reviewed which have been in my cellar for a while. I buy beer that I want to drink or try, sometimes things get pushed to the back. 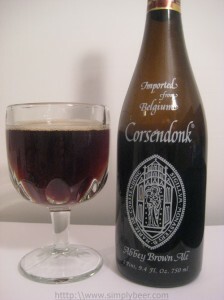 Tonight the Corsendonk Abbey Brown Ale gets pushed back to the front of the line. The Corsendonk is a Belgian style Dubbel, which tend to be malty, moderate to highly carbonated, low hop profile and may have a caramel sweetness. The Abby brown poured a chestnut color, little darker then I would have expected for a Dubbel, but within the range for the style. Very little head on the beer, what ever was there was gone with in several seconds. The zing of the carbonation was pleasant to hear, but caused the head to dissipate quite rapidly. The aroma was mostly a sweet molasses with hints of chocolate and alcohol. It was quite pleasing, they blended together nicely. A bold beer with a zesty spice to it. Very flavorful with caramel/molasses dominating the flavor rounded out by a hint of chocolate, spice and a carbonated effervescence that rolls down your throat. A strong beer, but if flavor not necessarily the alcohol. The carbonation places well in this beer helping to separate the flavors and adding depth and character to this beer. I found it well balanced and a pleasure to enjoy.